A lot of clients come to me saying that they struggle to eat healthily because they either can’t, or don’t have time to cook. Well with recipes as quick and easy as this one there are quite literally no excuses! Such a perfect dinner for these warmer, lighter evenings and packed full of protein and good fats. The ingredients can even be picked up from a corner shop or local supermarket on your way home – and you can customise the salad anyway you like it! Ten minutes front door to dinner plate – but how? Place the salad leaves and chopped cucumber and pepper onto a plate. 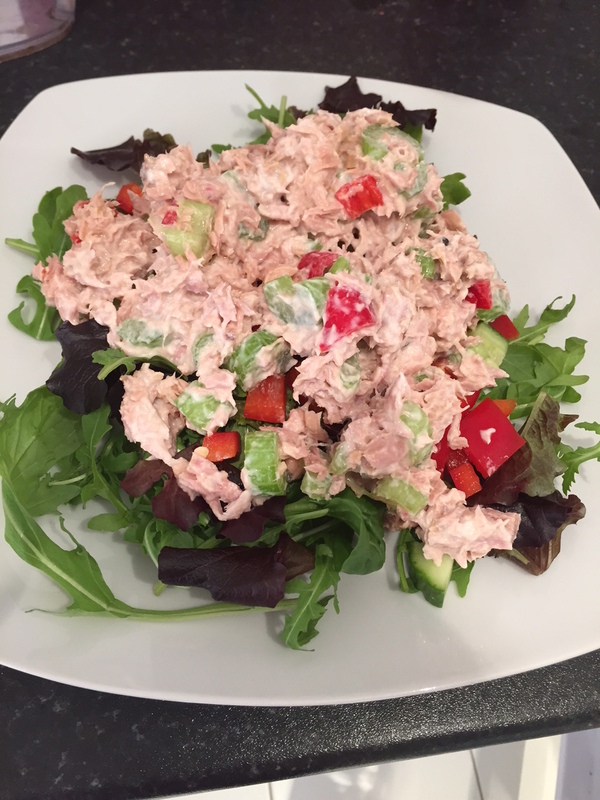 In a separate bowl, mix the sliced celery and chilli, drained tin of tuna and pot of yogurt until combined. Squeeze the lemon juice and stir in well – taste the mixture and add seasoning if desired – but the chilli and lemon should give it a real flavour kick. Spoon the tuna mixture on top of the leaves and voila – dinner is served! This is also a great make-ahead packed lunch option, and the salad vegetables are of course entirely up to you – you can replace the cucumber and pepper with any combination – tomatoes, radishes, red onions etc….. mix it up and enjoy!